Established in 1957 primarily as a Pearl Harbor Cruise operator, Paradise Cruise, Ltd. has grown in scope to become Hawaii's premier sight-seeing and dinner cruise company, employing over 400 crew, operating three vessels, and offering 13 daily cruises. Paradise Cruises has more than 40 years of experience and a deep commitment to excellence and has prided themselves on our ability to excel and innovate. 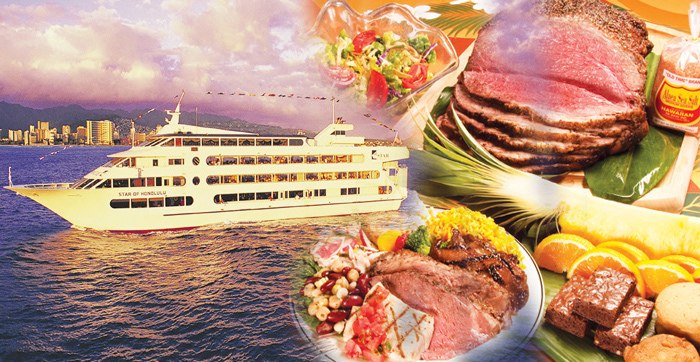 Paradise Cruise is a leader of Hawaii's cruise industry and the Star of Honolulu was the first dinner cruise ship in Hawaii to comply with A.D.A. standards for accessibility. Paradise Cruises are also the industry leader in providing true hotel and restaurant quality dining and banquet facilities starting with our luxury 5 star cruise with its 7-course French-style dinner and Jazz entertainment cruise. Paradise Cruises will continue to strive to exceed their customer’s expectations on all of the cruises. Paradise Cruises is looking forward to serving you onboard! Paradise Cruises is a leader is Oahu Sunset Dinner Cruises. Aloha! Hawaii Discount is a web based activity vendor for all the Hawaiian Islands. The company provides Hawaii Tours and Activities and Hawaii Car Rentals and activity reservations.